It was announced yesterday that Jamie Johnson, founding member of the Grascals, is departing the band after over 10 years and will be replaced by John Bryan. Jamie has been fighting depression for some years now and his departure will help him with that issue plus allowing him to spend more time with his family and son. Nashville, TN -- /Opry.com/ The Grand Ole Opry® presented by Humana® honored Alison Krauss on her 20th anniversary as an Opry member July 3rd at the Wednesday Night Opry with performances by Alison Krauss and Union Station, bluegrass great Larry Sparks, multi-award-winner Jamey Johnson, and more. Krauss was inducted as an Opry member on July 3, 1993. When Krauss joined the Opry at 21, she brought with her the hot pickers of Union Station. Krauss became the first bluegrass artist in 29 years to be inducted and the youngest cast member at the time. 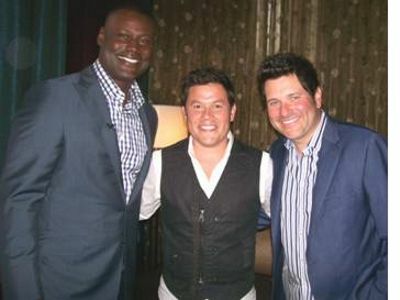 Nashville, TN --- Former Tennessee Titan Kevin Carter, along with Jay DeMarcus of Rascal Flatts, hosted the 11th annual Waiting for Wishes celebrity waiters dinner at The Palm Restaurant in Nashville. Celebrity waiters, including Jamie Johnson of The Grascals, donned waiters jackets to serve diners, sign autographs and accept donations.